In some cases, orthodontic treatment should be commenced early while the baby teeth are still present to prevent more serious problems developing in the later years. The Australian Orthodontic Society recommends that children should be seen by an orthodontist at 7 years of age. This is because a number of problems can be detected early and and possibly prevent more serious problems developing later on. 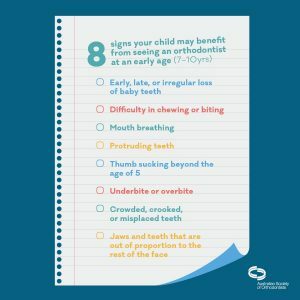 Problems such as thumb sucking, missing teeth, cross-bites, small upper or lower jaw might be able to be addressed early resulting in a less complicated treatment later in life. For the majority of patients, early treatment is not needed and we can monitor the development of the jaws, teeth and bite until treatment is needed. Usually we review every 6 or 12 months for no cost. If early treatment is needed, our aim is to make treatment fun and hassle free. Call our practice today to schedule your free assessment.